The selection of produce at the farmers market drastically scales back as we plunge into the onset of winter, like a “last vegetable standing” survivalist showdown. What remains are the the gnarly subterranean dwellers; parsnips, turnips, beets, daikon, potatoes, onions to name a few. With their knobby torsos and listless dirt-covered exteriors, these vegetables look like the aftermath of a catastrophe—a paltry display huddled under a few lonely tents, their dismalness echoed by the fleeting bundled passerbys hurrying through the cold and wind towards their final destinations. Note how we don’t pick up a parsnip, caressing it lovingly with our hands like we might an heirloom tomato or summer peach. 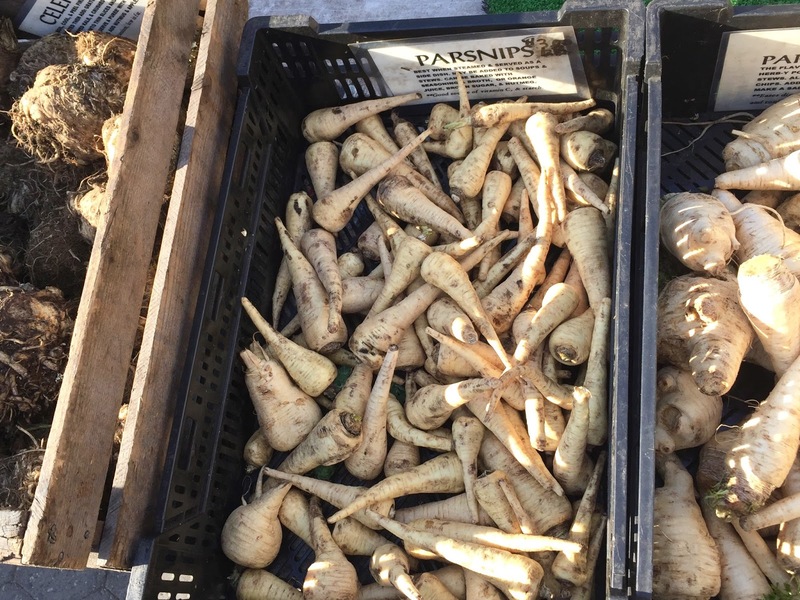 No, we spend a split second weighing the necessity of the parsnip versus the consequence of taking off our gloves, and if the former triumphs, plunder it into our bags before sprinting back off into the frigidness. 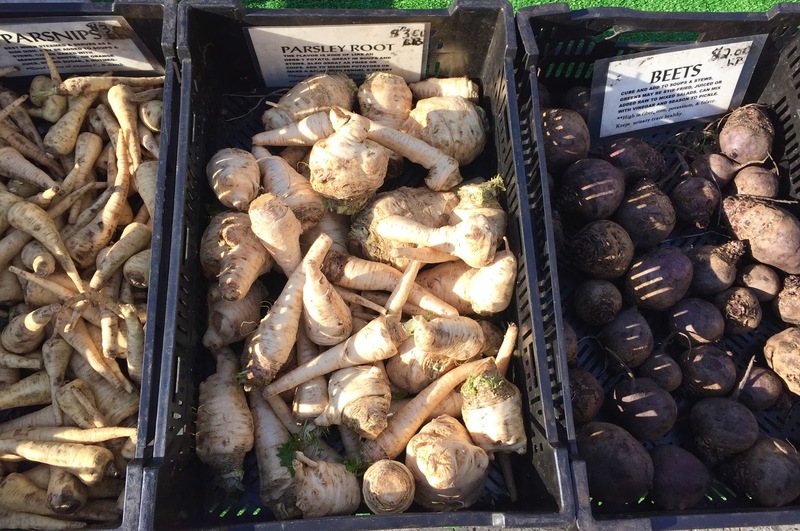 But how appearances do deceive, because these below ground tuberous, taproots and bulbs are truly the pearls of produce come wintertime. A quick scrub to remove that matted dirt, maybe a peel? and 40 minutes later—diced, roasted, with nothing more than a dash of olive oil, salt and pepper—these vegetables become regal. Warm jewel tones of gold, bronze, and deep eggplant simply glow, vibrant with their brown caramelized corners. And the taste! 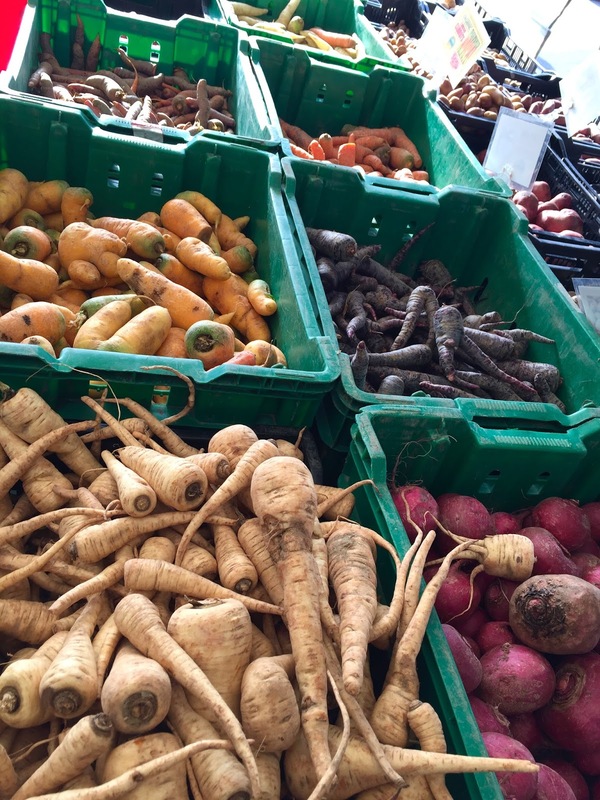 I marvel at the complexity of these vegetables, sweet as sugar with an earthiness—a heartiness—that keeps them in check. They have substance, thanks to the cooked-through starch embodying an almost burly, toothsome quality. I could eat this preparation for days on end, constantly enthralled by the luxuriousness of such trivial ingredients, before ever finding it tiresome. And to think that what I described is the root vegetable’s most basic preparation, the lowest recipe on the totem pole. Imagine the possibilities with a little spice, a little herb. Imagine the opposite of the first scene I described, and instead, the kitchen that all those bundled people were running to, the warm glow of the heat, the light, the coziness of being inside on a freezing day. Imagine on their dinner table, a heaping bowl of Hearty Beef and Rutabaga Stew. 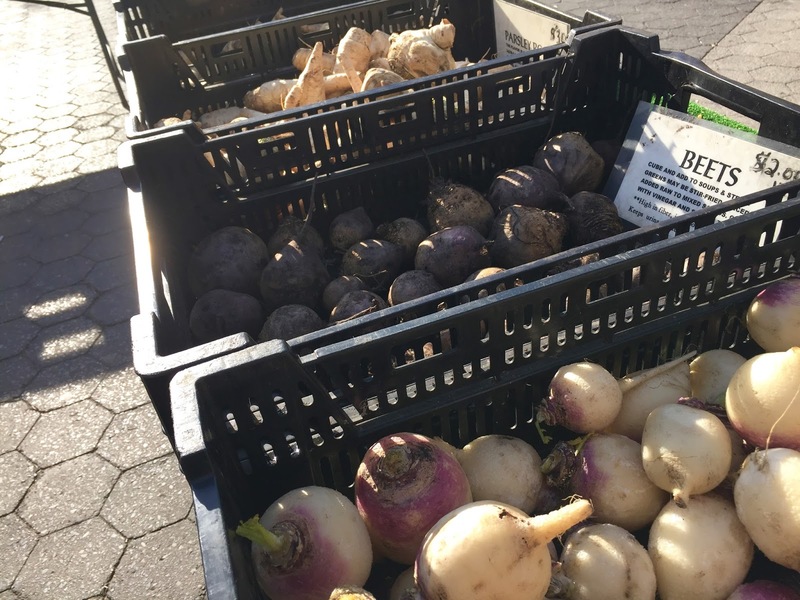 One of the most gnarled of all the root vegetables, the rutabaga is round and squat with an ombre exterior that fades from purple to cream. Its preparation is identical to that of a turnip, but upon cooking, it tastes much sweeter, like an extremely rich yellow potato. That being said, if you cannot find rutabaga, turnips are a perfectly acceptable alternative for this recipe. I actually used both. This recipe confines its taproots to carrots and rutabaga, but feel free to add other types such as kohlrabi, celeriac root, and parsnips, too. 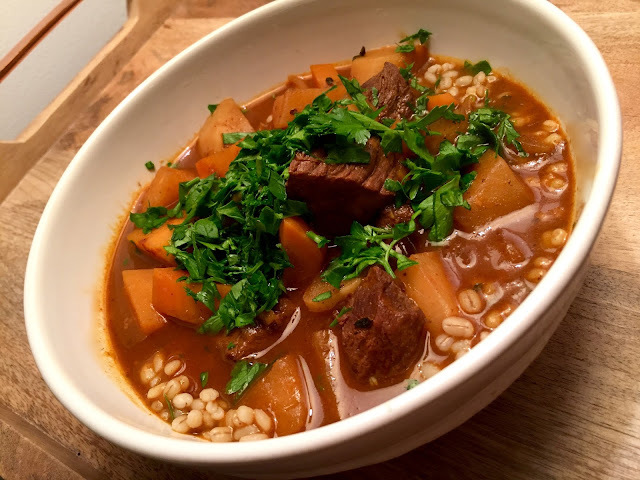 In my book, the hallmark of a successful stew recipe is one that fulfills its duty of being hearty, robust, and satisfying without also being excessively fatty or rich. To garner flavor, this stew relies on a plethora of Middle Eastern spices and other basic pantry items, like tomato paste and red wine, for acidity. I substituted vegetable broth for the beef broth, which also contributed to the lighter feel. Initially, I felt like the stew was missing some acidity, and tried to compensate with extra tomato paste and wine. By the next day though, I realized the flavors just need some time to sit, and a simple swirl of red wine vinegar before serving would do the trick. (If you like tomato-based stews though, I do suggest doubling the paste). Taste-testing is key to this recipe, depending on your preferences regarding salt, acidity, and herbs (I added dried thyme, too, which I highly recommend). If you can, make this stew a day ahead for optimal flavor fusing. 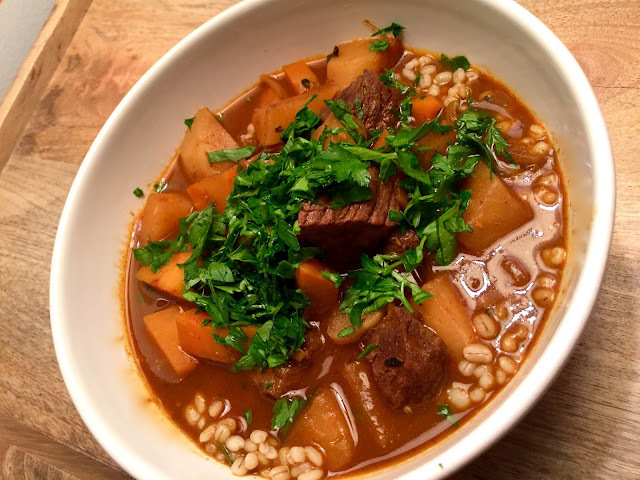 I served this stew over a bed of barley, and it hit the spot completely, getting better every single day as the flavors continued to meld. Now, instead of mourning the end of the harvest season, rendering obsolete some of Fall’s greatest hits, I relish the thought of exploring the culinary offerings of these versatile roots in the upcoming months. 1. Sprinkle steak with ¼ tsp salt and pepper. Heat 1 Tbsp oil in a large dutch oven or saucepan over medium heat. Add the steak and cook, stirring frequently, until no longer pink on the outside, about 4 minutes. Transfer the steak to a plate. and remaining ¼ tsp salt. Cook, stirring occasionally until the onion begins to soften and the mixture is fragrant, about 5 minutes. and cook the steak through, about 2 minutes longer. 5. Before serving, taste soup and adjust seasonings to taste. Divide the stew between bowls (over barley/farro, or with bread) and top with a swirl of red wine vinegar and plenty of chopped parsley. Hungry for Kvell's latest and greatest? Receive recipes straight into your inbox!